I saw back in March - Jennifer McGuire using Ranger Oxide ink.. I bought them as soon as they came out.. 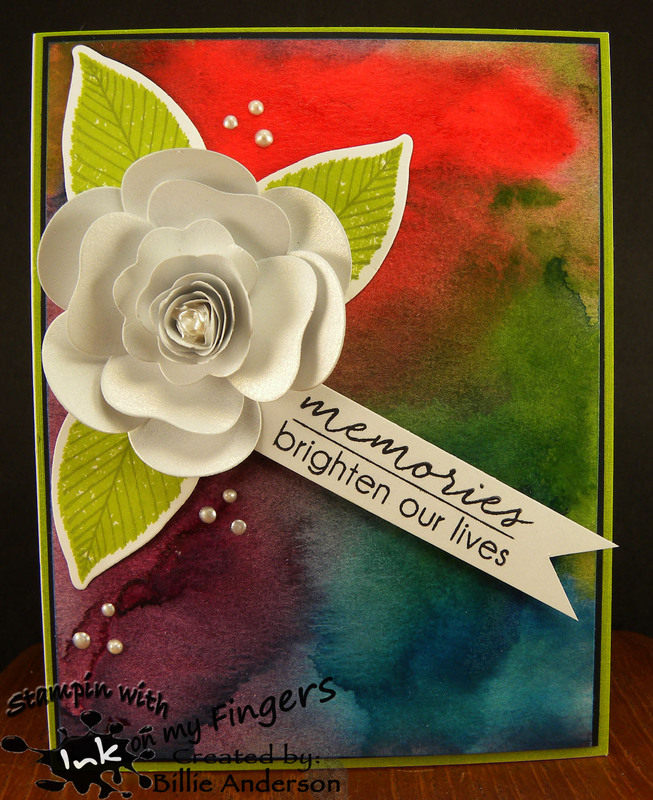 I was so taken with what she did with the different card stocks she stamped on I had to give it a try.. I chose the Kraft.. but you can use black, white, almost any color.. The Oxide ink sits on top of the card and it's a strong color but not too powerful. 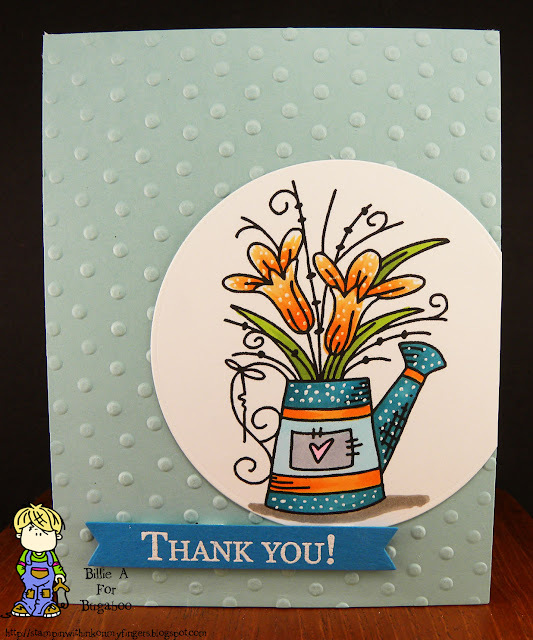 I stamped flowers all over the card. I used PTI, SS flowers and leaves.. I then spritzed the card and the inks even popped more then before.. If you haven't tried Oxide ink you have to. They're great.. I then die cut the Thanks from MFT. I double stacked it and added the SS stamp sentiment below.. I used my white gel pen on the flowers and added some Nuvo clear drops.. This card is so pretty in real time.. Welcome to Friday at Catch the bug.. 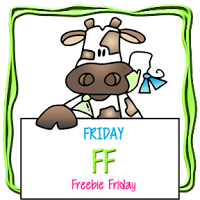 This is the Free Friday image... called Tulip can.. I wanted to keep the card CAS.. So I embossed the background card stock with large dot folder. I then colored the image with copics and added some white gel dots. I added it to the embossed card stock and cut the edge off. I embossed using white powder the sentiment from Tech. Tuesday. I used My Favorite Things banner die. I used foam tape on the back. I like the CAS look. Well hope you've been enjoying your summer. It has been nice. 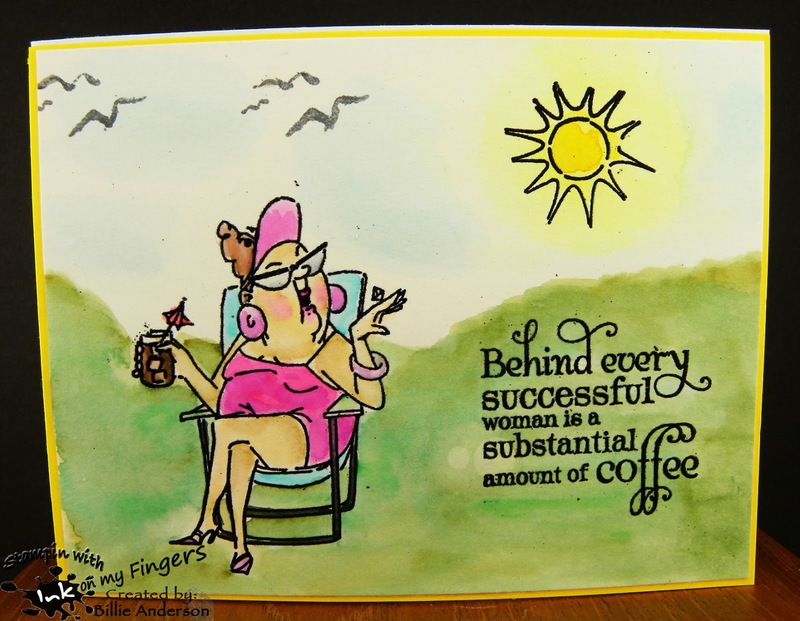 I am so glad being retired that I get to enjoy the sun instead of looking out a work window and wishing.. Or just enjoying an hour in the card driving home. 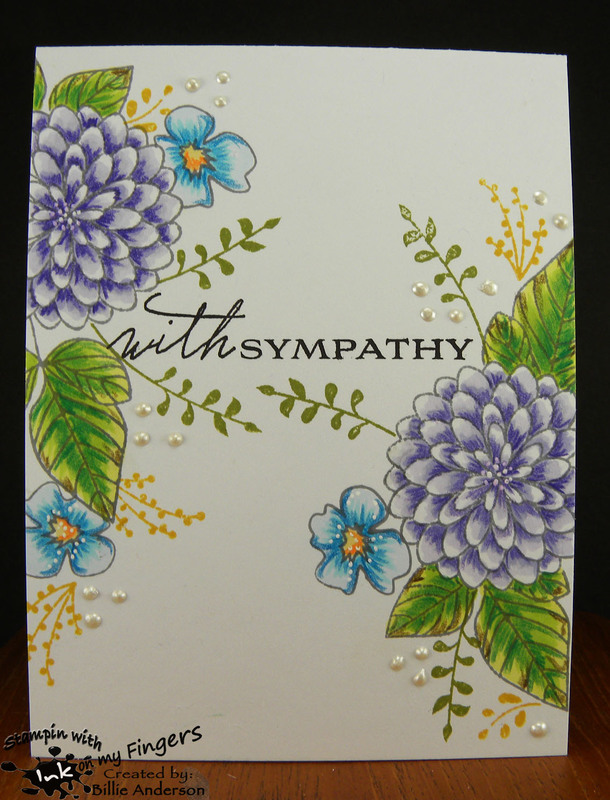 I had a request for a sympathy card so I put my thinking cap on and this is what I created. I used some Simon Says flowers and leaves from various sets. I used Paper Trey Ink sentiment. 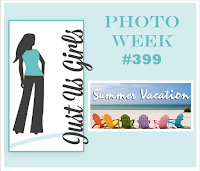 When I stamped the images I used Memento grey ink. I didn't want a stark black.. I think the grey work.. what do you think?? I colored the images with copics then went in with Prisma colored pencils and white gel pen and completed the images. I added some Nuvo drops to the background. I love the way the flowers came out.. I have been using more and more colored pencils with copics and I think getting better and better. 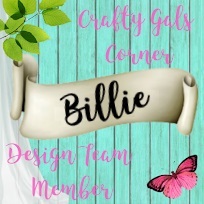 This is my card using the image Just Me... I like her little patch work outfit. She obviously dressed herself.. Funny. I remember my children dressing themselves and thinking they look awesome.. I thought this card would be great for a grandma or aunt.. someone special to give to a little girl. I know I love my grandkids/great grandkids hugs.. They are my favorite. I used My Favorite Thing's stitched oval die and sentiment. I colored her with copics and then used some twine and wooden hearts which were colored with copics and then topped with glossy accents. I added some white dots to her outfit with gel pen. I hope you find time to play along and create a card for a child plus sentiment. I have been watching bible journaling for quite while and love how people are so creative and knew I wanted to do this. 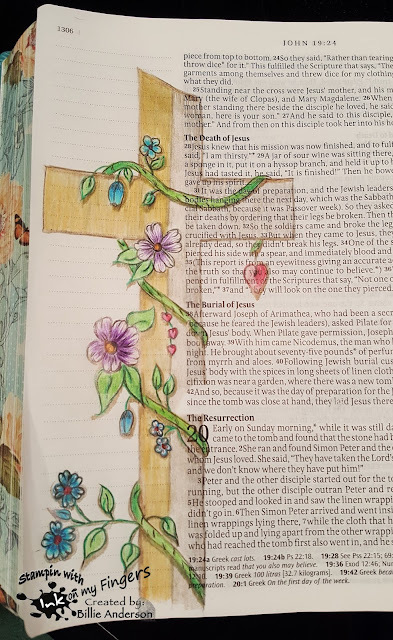 I have been going to a bible study group and was talking to a couple of the ladies that do the bible journaling and they get together a couple times a month to just do bible journaling. So I went to her house and she had some photos of different images that went with certain verses. Well some are quite detailed and some are simpler. Since this was my first attempt I went with simple plus I liked this one better. It spoke to me at the time. I started by creating the cross first with just a ruler. Drawing out the cross. Then I drew on the vine and then drew on some flowers and leaves. They are colored with colored pencils. I don't want anything to bleed through the thin paper and I didn't want to do the gesso trick. So this is what I created. I tried to keep it simple but have fun. Sure it's probably not proportioned right but this is new to me and I am not an artist with training. I do love it and look forward to the next get together. This bible also has pages where you can color in the printed images, scriptures that came with the bible. 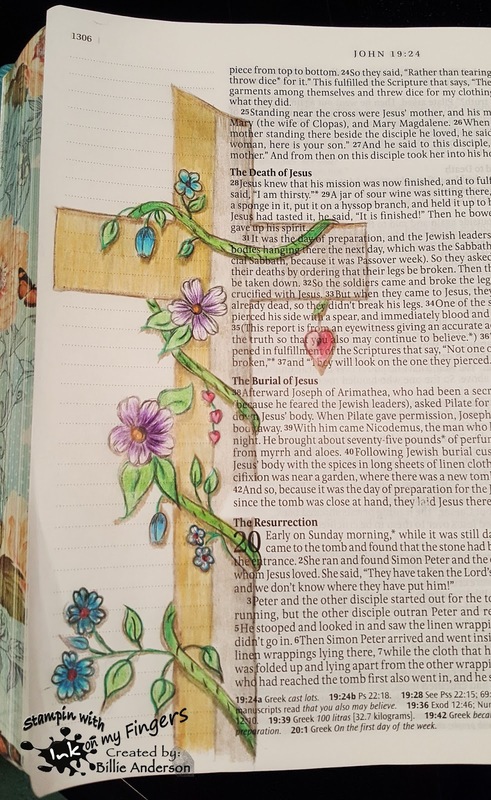 It is a journaling bible so if I did not want to draw in the bible I could still color.. but I do like to create my own pieces. I will probably post my next creative piece. Hope you enjoy this and or I inspired you. That is how I got inspired by watching videos and seeing others posting their creative art pages. This is my next card for the challenge. 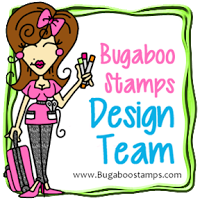 This is the background stamp that I used to stamp on the coffee cup for Mondays card. I stamped the allover stamp by Hampton Arts on my paper. I then took Zig markers in various browns and wanted it to look like sand but also like coffee. I stamped the coffee cups by Simon Says and colored with copics. I fussy cut them out. 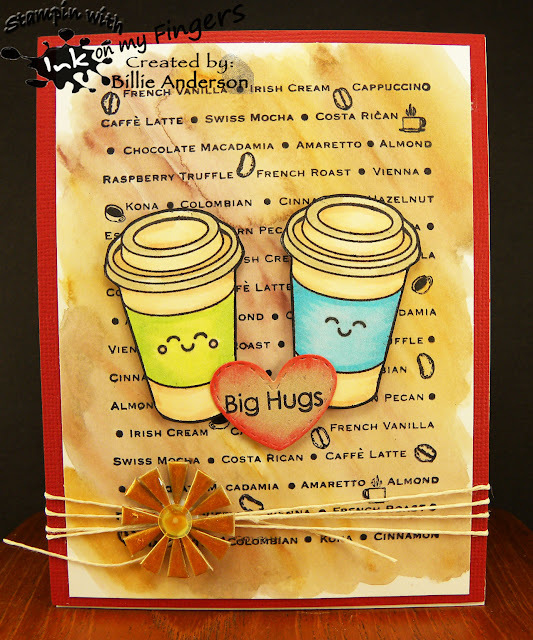 (I made the blue one my hubby and the green one is me) I then wanted to have a cute sentiment so die cut a My Favorite Things heart and used MFT big hugs stamp. I went around the edge with some Ranger inks. I added it between us.. Awh... I then added some twin below and wanted to add a sun but dies I had were too big so found 2 chip board pieces and painted Lumiere over them then layered them and then added a yellow sequin to the center for some more yellow. I went over the blue / green and heart with Spectrum Noir glitter pen. So you have any plans for 4th of July? it's sure coming up fast. Living in the country I am not a fan of the 4th. Too many illegal fireworks.. Fire hazards and late night noise. I am glad this year I am retired so no need to get up for work the next day. That's the only plus this year.. Be safe what ever you do and enjoy.. This is my card.. I made the water color background using the Kuretake Gansi Water colors. I wanted the outcome to be dark because I knew I wanted to use this My Favorite Things Camellia flower.. If you read my blog and remember. I bought by mistake some light silver shinny paper .. well thought that would be perfect for the flower.. I like the look and shine. I then used Paper Trey ink leaves and dies and inked with Altnew inks. I was looking for a simple smaller sentiment and saw this one from Tech. Tuesday and so stamped it and cut the banner. 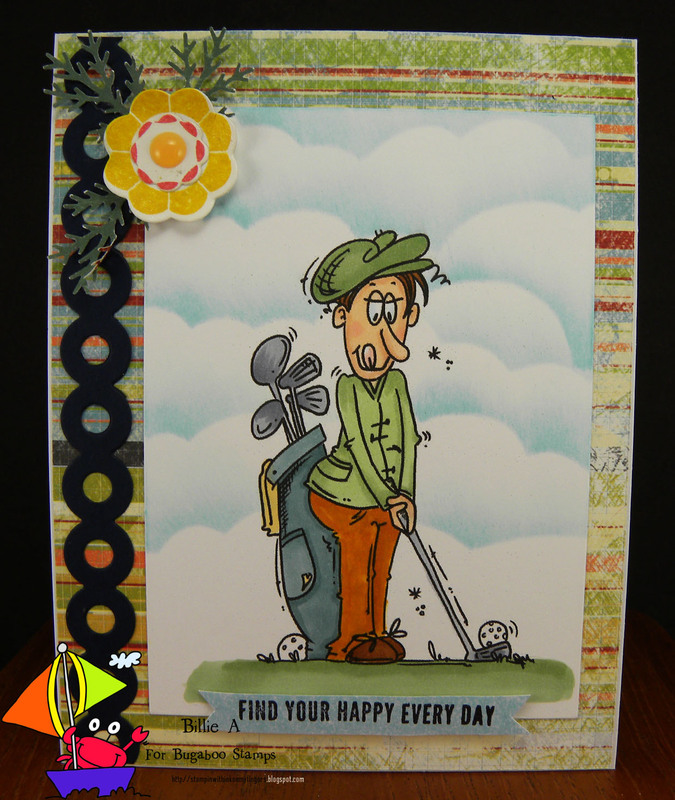 I used some Nuvo drops on the card and layered it. It's done.. I like the look. 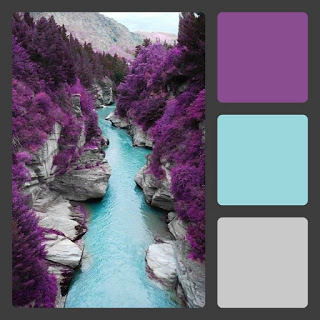 Those colors are so rich. 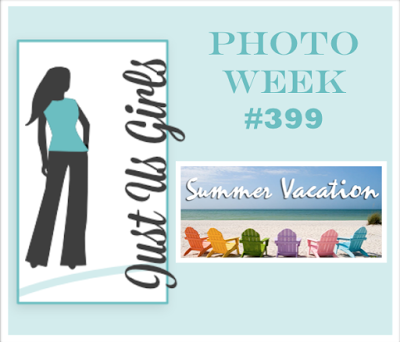 I hope you get time to see the DT creations for this challenge. So digging through my stamps I found this awesome stamp set from Art Impressions... She WAS holding an orange/or lemon drink.. but I removed the ink from the fruit piece and now it's an iced coffee.. I stamped the images (except for the birds) with Versa mark and black heat embossed. I then took my Zig markers and colored the scene. I added some birds?? don't know who they are by.. the sentiment from Verve stamps. This card was so much fun to create and fast. 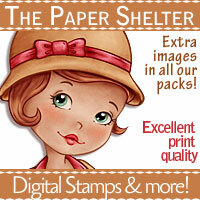 And today at Catch the bug we have New Release day.. You can find the image in the Bugaboo store.. This is Xmas jar.. Just in time for our Christmas in July coming up next month.. July 15-21.. I had this teal piece that I cut a banner out of at one time it was in my pile of scraps.. Well I thought why not use it and just put a sentiment behind it.. So that is what I did. I used the Simon Says - Be joyful sentiment.. perfect fit. I colored the images with Copics and then added Spectrum Noir to the ornaments and stars I used a little bit of white gel pen to a few areas. I used My Favorite Things stitch die. oh the banner die cut out is from My Favorite Things also. I said yesterday I was short on having coffee/tea related images.. Well I looked at some old stamps and found more.. woo hoo.. 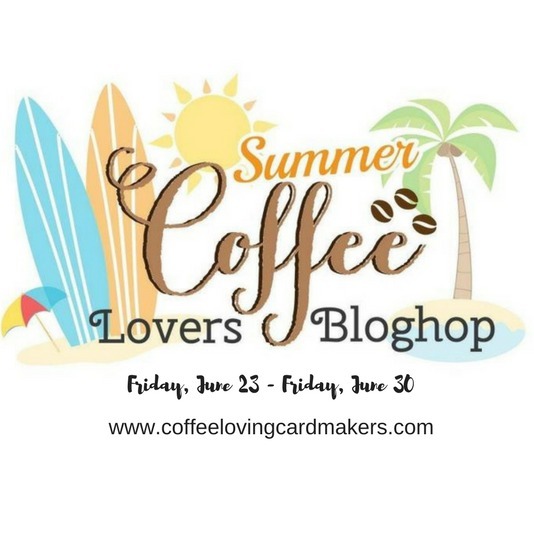 This is my summer coffee lovers card. I used some nice summery colors (Ranger inks) for the background after I heat embossed the cups (Verve images) with white embossing powder. 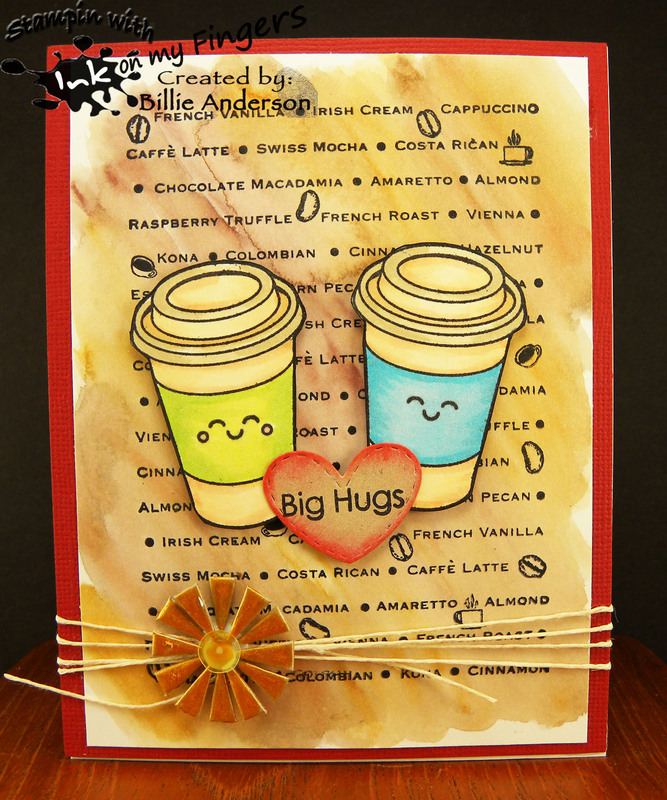 I then found this coffee cup die (Simon Says) and die cut it out and removed the little coffee piece and heart. I found an allover coffee related stamp (Hampton Arts) so stamped the coffee cup. 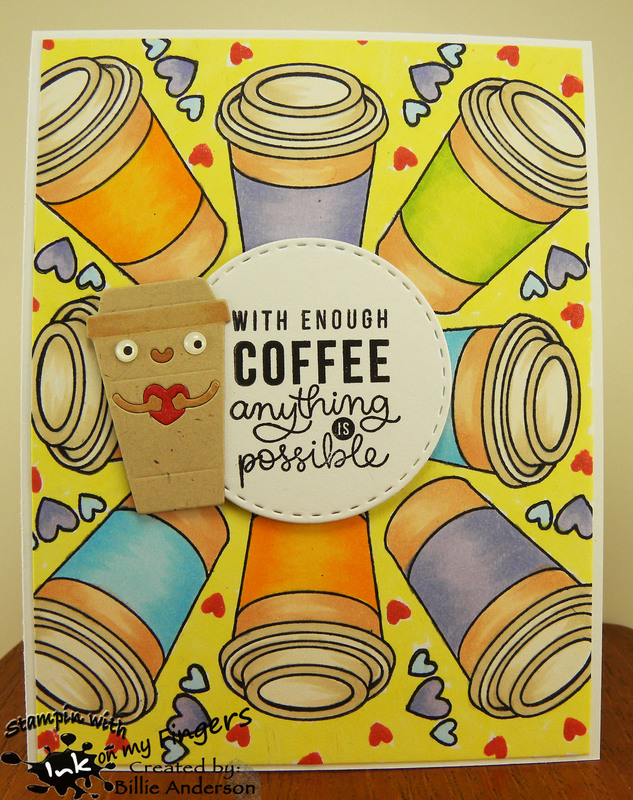 I then colored the heart and coffee strip with copics and went over them with Spectrum Noir glitter pen. 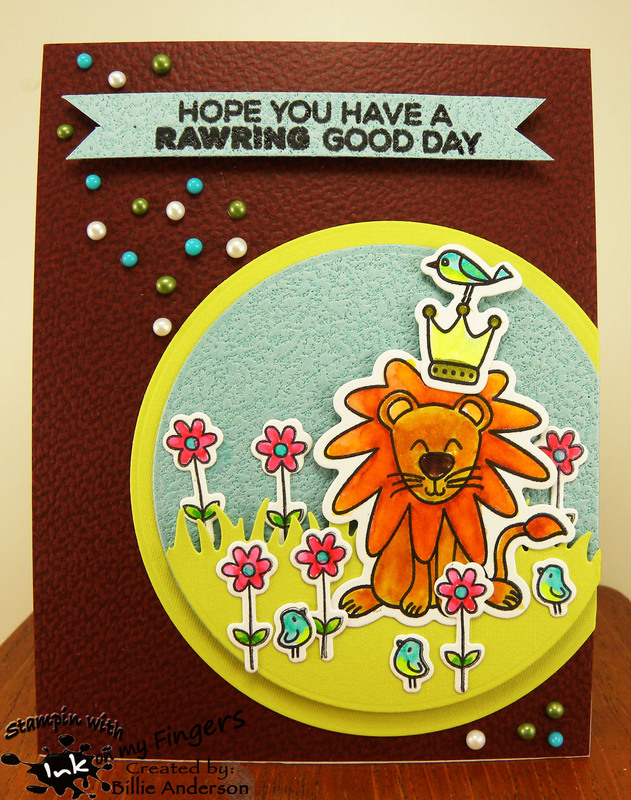 The sentiment is from Simon Says and I used a stitched circle die from SS and cut it out. I removed the bottom half. I layered all of the pieces together. I found this awesome ribbon that has swirls in it that reminded me of steam. I decided to make a card using my favorite colors.. WELL one of my favorite combos.. I like brown, green and teal.. my computer doesn't do the colors justice.. I hope your computer looks like the true colors.. I wanted it to be kind a summery looking with the flowers and nice green grass. It is summertime here after all.. sure took it's time heat wise to get to a temp I like. HOT. If you want to play along go to the above link and join in. 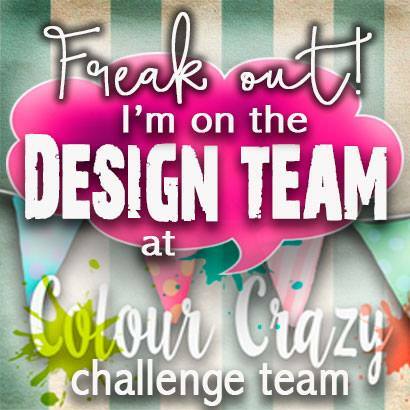 There are 77 sponsors and so we have a great chance to win.. if not at least we made a fun card and got inspired by so many talented crafters..Thank you Amy Tsuruta for this awesome challenge and time it takes to put together. Since the theme is summer coffee.. and I am limited to coffee stamps.. I went with summer colors. I used copics for all of the coloring. Personally I like blended, hot, latte, ice coffee. I am not picky. BUT it does have to be with a creamer.. prefer caramel type creamer. 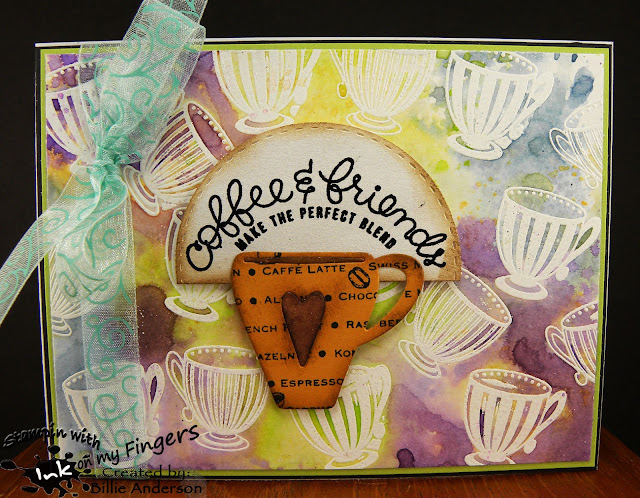 I first stamped the Simon Says to go coffee cup and hearts all over the card. I then colored the background in light yellow and did the coffee cups in rainbow colors. I stamped the sentiment also from Simon Says and die cut it out with a Simon Says stitched circle die. I added it to the card with foam dots. I had this small Coffee cup die from a Simon Says monthly kit so I used Kraft card stock and die cut it out and colored the nose, arms and heart with copics. I added some fun doodle eyes. Isn't this the cutest coffee cup to finish this off I went over the hearts with my Spectrum Noir glitter pen... As I made this I fixed myself a cup of coffee to help with my mo-jo!.. I wanted to give the background summer looking fun bright colors. So this is what I came up with. I thought since I have some of these My Favorite Things frames left over from an earlier card project I would put it to use and make my animal card. I added ranger ink behind the windows and spritzed with water.. I used Stampin Up silhouette stamp to give a floral background interest. I then stamped these cute Mama Elephant animals and hats. I colored with copics and added to the frames. 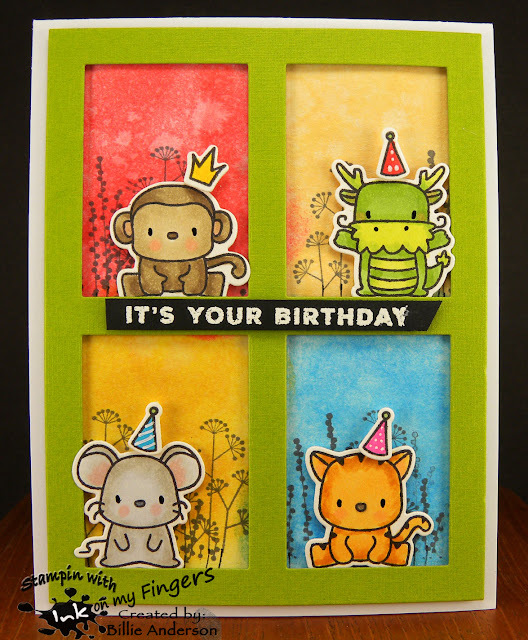 I thought the monkey is the birthday animal and so the crown, the others are at his /her birthday and so they have the party hats..I added some dots and stripes with white gel pen. 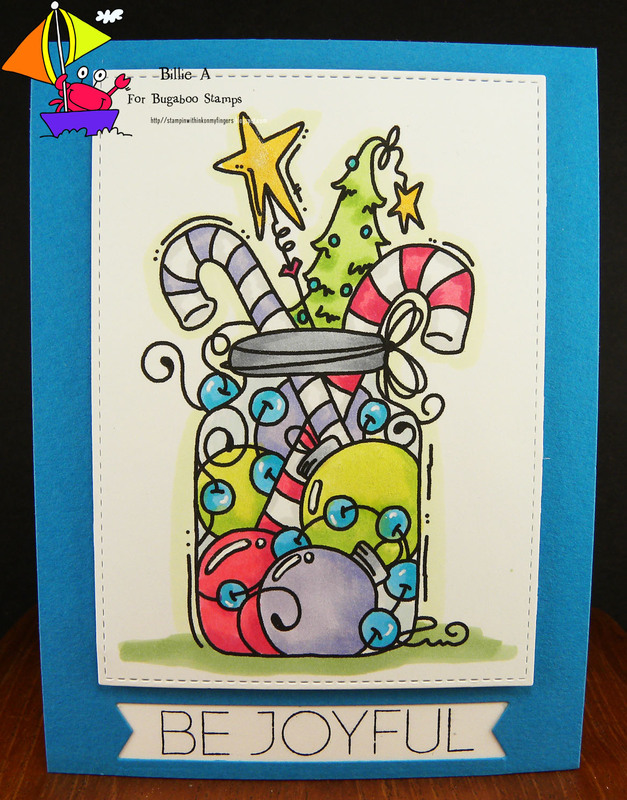 The sentiment is from a Simon Says and heat embossed with white. I think this would be a cute birthday card for anyone. Anyone who is a party animal.. 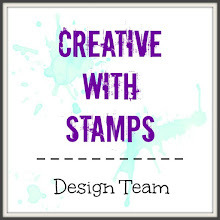 Playing in my craft room I saw this bike stamp that I have from Paper Trey Ink.. it's an old stamp (I have the die also) and I got this pig stamp set a few months back from My Favorite Things.. and knew I wanted to make them work together... I LOVE this look and fun card. 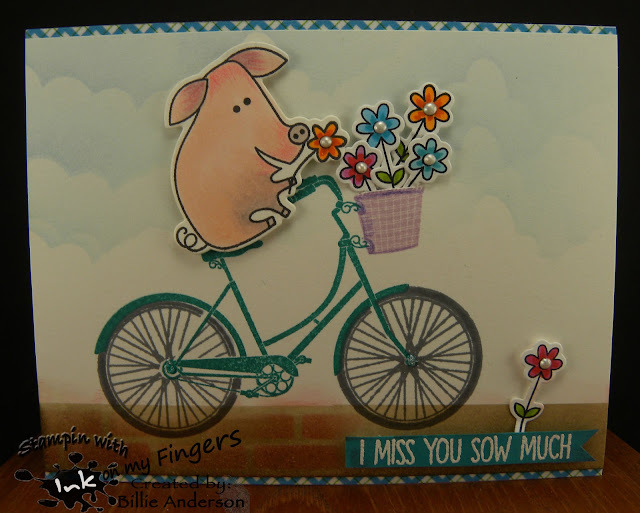 I stamped the bike with Stampin up ink and the wheels in grey Momento ink.. I liked the grey color. I stamped the basket with Stampin up. The pig, flowers and sentiment is from MFT.. Love this set. I colored the images with copics / colored pencils and added some Nuvo drops to the flower centers I used a brick stencil for part of the road and my cloud template for the sky.. I guess I need to start going darker cause I can hardly see it in the photo. I wet embossed the sentiment in white. I used some Washi tape at the top and bottom of the card base and then used foam tape behind the main panel I also made a slit on top edge of the basket so I could put the flower stems in and tape to the back.. so it looked like a basket full of flowers. I hope you get a chance to pick up this fun image. This is the Free image.. Golf Guy... I grabbed a piece of scrap card stock from my stash and an old piece of a die from Paper Trey Ink.. the circle die on the side. Then I found this flower that I did not use from awhile back from Stampin up I added some Martha Stewart fern punch pieces.. I colored the image with copics and added my cloud template.. The sentiment is from Simon Says. When it was all put together I added a drop of Nuvo to the center of the flower. I think it's a fun card. I was digging through my stamps and found this old one.. I live in the Pacific Northwest and the Pacific ocean is all along our coast. I have not used this Seattle ferry in ages. When my hubby worked in the shipyard he rode ferries to work. He would drive from our home to the water front and park his vehicle and get on the ferry as a walk on and it's an hour ride over to where he worked. He really liked the relaxing ride. Growing up and even in my older days we would take the a ferry to Orcas Island or over to Port Townsend and camp or visit the awesome small island treasures. I have happy memories growing up taking the ferries to different areas across the sound. The mountain in the background could be Mt. Rainier or Baker.. We have mountains all around us The Olympics to the West and Cascades to the East..
Of course lots of seagulls. 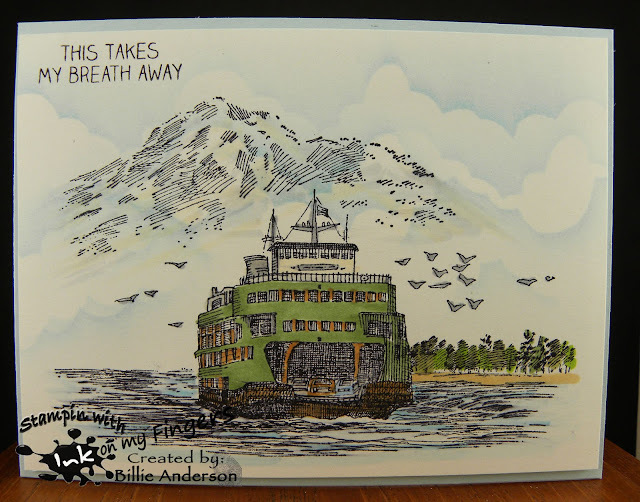 The stamp is by Stamping room only.. Our ferries have two tone white and green bodies but I wanted it to stand out and not blend with the background sky so I did it green. The sentiment is from Tech. Tuesday. It's true.. this does take my breath away. I am such a water person and love this beautiful state with lot's of water and mountains and greenery. I used copics and Prisma pencils for the colors. I also used my cloud template. So are you having a great summer? Doing anything fun.. I tell you being retired is so awesome. Being able to run to the sound and just spend the day in my craft room. So this is what I created. This is my card. I took a Simon Says stamp and did the happy birthday all over and then took a plant looking stamp from Simon Says and filled in the gaps. I used Ranger ink. 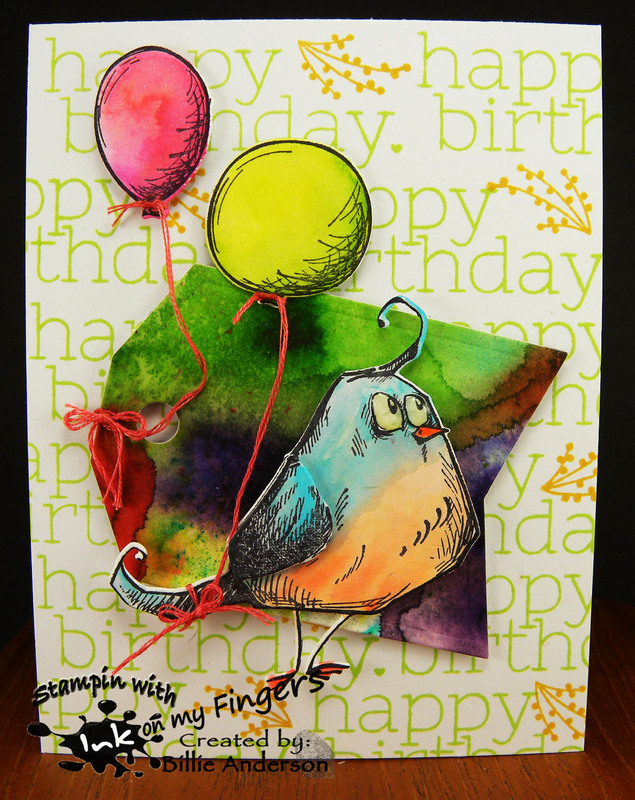 I then stamped the Tim Holtz crazy bird and colored it and the balloons with Zig markers. I took some Ken Oliver color burst and used it on water color paper and dried it. 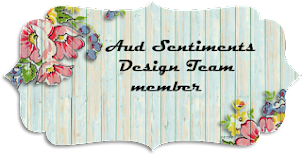 I took a Reverse Confetti banner tag die and cut out the awesome colorful tag. I added the bird and balloons along with some floss one tied to the hole in the tag and one to the birds tail.. I did Nuvo clear drops on the eyes and Spectrum Noir on the balloons.